Went to most of the Good Beer Guide pubs in soho and this was the best beer. Very good pint of London Pride. A quiet gem. Good draught well kept and served by knowledgeable staff. Spartan in decoration and challenging today without heat. Nice enough pub. Decent ale, strange music in the background, Dead Kennedys then jazz/funk. I've only been in this pub twice. It is like a small miracle or an oasis in the desert of shite that is Piccadilly. Please do not go there as I don't want it to be too crowded. Too late - the suits are already assembling like a flock of vultures on the pavement. 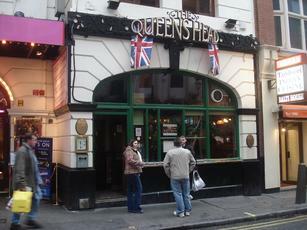 The Queens Head was a nice little find just off Piccadilly Circus. It's a fairly small, narrow bar with just enough seating. World Cup football was being shown. I didn't notice the downstairs bar. Ales were Dark Star Summer Solstice, Fullers London Pride, Sambrooks Wandle, Robinsons Trooper & Moncada Notting Hill Summer. There are no real ciders. But they do have Aspalls and Sandford Orchards Devon Red from the keg. One of the best pubs in this area.